Make your space heroes, alien monsters, and starships stand ready for galactic adventure with this collection of sturdy Starfinder Pawns bases. Designed for use with the Starfinder Roleplaying Game, this set includes 18 bases—11 Medium bases*, 5 Large bases, and 2 Huge bases—that are perfectly sized for battles on Starfinder maps or other gridded game mats. 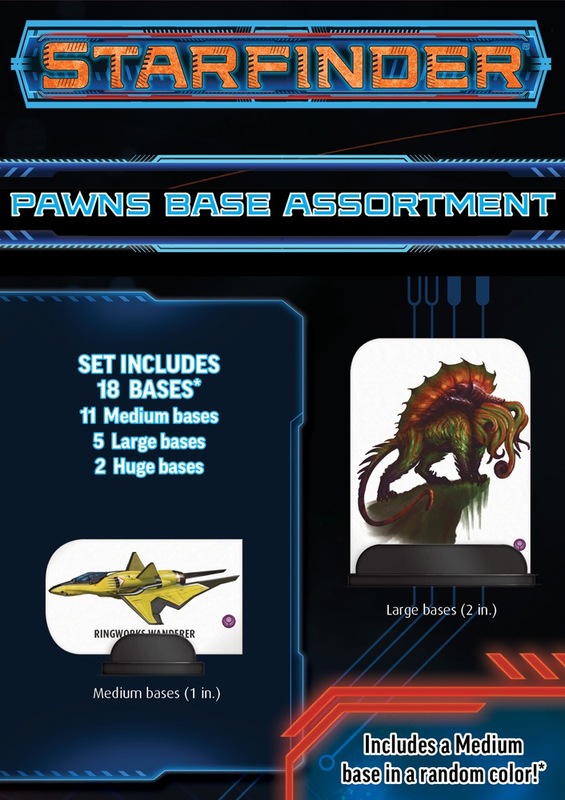 With Starfinder Pawns Base Assortment, fill the spacelanes with all the alien creatures and starcruisers your game demands! Note: One of the 11 Medium bases is a random colored base (Yellow, Orange, or Purple) and additional colored bases in all three sizes are available as well. Now available for preorder! Packaging is not final and may vary before release! How are these going to be different from the basic Pathfinder Pawns bases? All your huge bases are belong to us. If you have any of the bases we've made in the last few years, you'll note they have the Pathfinder logo on the bottom. These have a teeny little cartoon Erik Mona* on the bottom. Okay, it's really the Starfinder logo. As an international customer, I really appreciate splitting the bases out from the pawn collection, rather than offering a "Starfinder Box". It worked out to be a very expensive cardboard box the other way. To confirm, these are round bases? No hex bases with facing will be available for starship pawns? No, from the pictures from GAMA, it looks like that their solution to facing is going to be to print the starships sideways, so you put the long edge on the base instead of the short edge. Then you can just point the front of the ship in the direction its facing. Updated with final packaging and description. So there are 10 black medium bases inside and one medium base of (hopefully) another color (red, blue, green...) in addition to 5 black large bases and 2 black huge ones? That's correct. The 11th medium base will be either yellow, orange, or purple. The new colors will indeed be available separately! Yes! It appears my red, blue, and green bases will soon be getting some company. Is this a subscription item? I don't see a note about that in the description, but I assume that it should be one. I went ahead and ordered some! Why in any planet would you put out the pawn and not put out the bases at the same time??? The first set of pawns came out with the core rule book in Aug. And the bases don't come out till Sep.
You could use Pathfinder bases in the meantime. They are functionally identical. But yes, it's weird. We intended for the pawns and bases to both release in August, but the bases were delayed at the manufacturer. If you don't want to wait and you know someone with a 3D printer you can download an STL file of medium bases numbered 1-10 or colossal or gargantuan bases and print them in any color you want. I haven't made and large or huge bases yet, but I might if there was interest. I wonder why Paizo doesn´t make them? The numbers are a much better idea than different colored pawns or bases, because goblin 1, goblin 2 & goblin 3 are way easier to do than blue goblin, red goblin and green goblin. Also the old "gargantuan or colossal pawns don´t look good on the tabble" trope is simply not true. I played with them (and the paper minis include them too) and they look good and they would also fit on the same cardboard pages that the pawn collections use size-wise (together with a few large pawns as to not waste cardboard). "Our most recent info tells us that the red, green, and blue Pathfinder bases will be back in stock in mid September as will the Pathfinder Base Assortment bags. The Starfinder Base Assortment bags have moved to an October release and the Starfinder yellow, orange, and purple bases should be available around the same time." 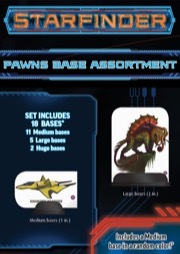 One piece of information that I recently got from a friend who said that he has the Pathfinder pawns and bases: The Starfinder pawns are noticeably thicker than the Pathfinder pawns and thus won't fit into the Pathfinder pawn bases, according to him. While I am usually inclined to believe him in such matters, I am a bit surprised that nobody else has mentioned that. Maybe he has some other type of fantasy pawns that are thinner than what Paizo makes? They work great in pathfinder bases. We haven't made any changes to the thickness of the pawns. To expand on Vic's comment, outside of the logo on the bottom and the variety of colors, the SF and PF bases are identical in every way. I just tested it and YES, SOME OLDER pawns are indeed thinner than the medium and small pawns from the Starfinder Core Rulebook Pawn Collection. It seems that the "Pathfinder Bestiary Box" & the "Rise of the Runelords Pawn Collection" too, had thinner cardstock. The "Pathfinder Bestiary 2 Box" pawns seems to have the same thickness than the Starfinder pawns. Some Pawns don't go all the way down inside the bases. This may be a problem only when using first printing versions of the very first few pawns products. It doesn't sound like you need anymore confirmation, but I've used Starfinder pawns with Pathfinder bases and didn't notice any issues. I have the first printing of the Bestiary Box (before they put the set name on them), as well as the Starfinder pawns. I've mixed and matched with no issues. I've noticed no difference in thickness for any of my pawn sets. And all adventure paths except Giantslayer.